Featured photo by Impact Photography. Most viruses are species specific, meaning that they’re adapted for a particular host and don’t generally infect other species. Human influenza (the dreaded flu) won’t infect the family dog, and canine distemper won’t be a problem on a horse farm. Rabies is very unusual in that it can infect any warm-blooded animal. Since it can be passed between animals and humans, it is called a zoonotic disease. If left untreated, rabies is fatal. Each year, between 60 and 70 dogs and more than 250 cats get rabies from a wild animal in our country. This is because these dogs and cats were not vaccinated. In Los Angeles County, it’s generally bats that transmit rabies. In 2016, 38 rabid bats were found in Los Angeles County—58 percent in private residences and 27 percent indoors. At least 13 people and 14 pets were exposed to these rabid bats. Symptoms of rabies in animals are variable. They initially include vomiting and breathing difficulty. As the disease progresses, neurological symptoms (circling, difficulty walking, paralysis) and behavioral symptoms (aggression, fear of water) set in until death ensues. Initial symptoms of rabies in people are fever, weakness and headache, progressing to tingling, anxiety, abnormal behavior, hallucinations, difficulty swallowing, coma and death. A person bitten by a suspected rabid animal is given injections of antibodies known as post-exposure prophylaxis. This is effective and prevents death if given soon after exposure. People who have a possibility of high exposure, such as veterinarians, can get a rabies vaccine as a routine preventive measure. Animals suspected of rabies are not treated but are quarantined, even if vaccinated, to see whether any symptoms develop. Symptoms develop within 10 days in animals. The entire state of California is considered to be a “rabies area.” This deadly virus is carried by all kinds of wildlife, including raccoons, bats, opossums, coyotes, skunks and foxes. Vaccinations have done a tremendous job of preventing the spread of rabies from these wild animals to our pets. Thanks to the success of these vaccines, dogs are not considered a reservoir of rabies in our country. Since rabies is a fatal disease, manufacturing and transportation are highly regulated to insure that the vaccine is effective. Rabies vaccines can only be given under the supervision of a California-licensed veterinarian. State law in California requires all dogs over the age of 4 months to be vaccinated for rabies. The first vaccine can be given as early as 3 months of age but no later than four months of age. This first vaccine is good for a year. At that point, it is given every three years for the life of your pet. 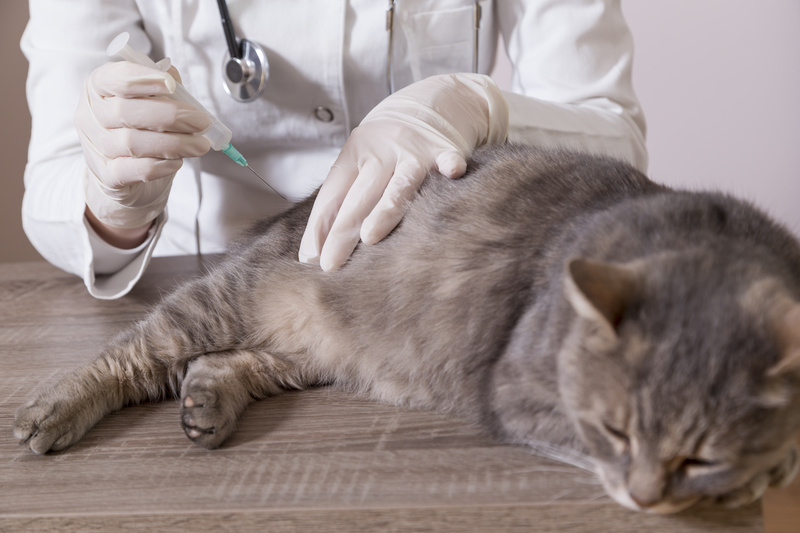 California state law does not require cats to be vaccinated against rabies. There are some counties, though, that do require rabies vaccination and licensing of cats, one of which is Los Angeles County. More cats get rabies than dogs, so keeping all cats vaccinated for rabies is strongly recommended. Even indoor cats can be exposed to rabies. This has occurred when a wild animal, especially a bat, enters the house. A wild animal exhibiting an abnormal behavior as a rabies symptom can easily enter your house. Once in the house, your pet is at serious risk for getting bitten. For additional information on rabies, please visit our website.